Then ... Helen returns to her rented room at a Reno boarding house on a well-to-do street lined with mature trees and lets her landlady know she will be returning to San Francisco the next morning. ... and Now, CitySleuth is still searching for this location and would be delighted if in the meantime a reader might recognize where it is and let him know. Then ... But first, one last fling at the Northern Club casino where we get a glimpse of its glitzy neon awning and marquee. ... a vintage photo ... 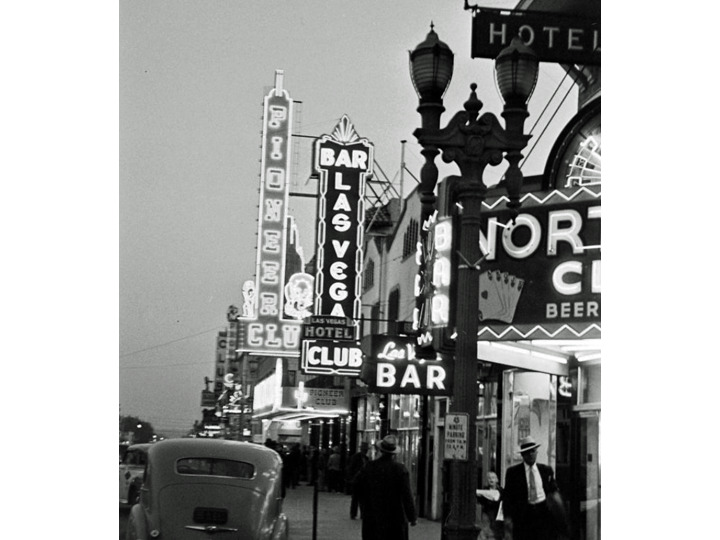 There is a Northern Club in Reno but reader HH has pointed out that the exterior above was filmed at the Northern Club at 15 E. Fremont Street in Las Vegas; the Northern closed in 1942 so 5 years later the moviemakers used stock footage for this shot. Here's a vintage photo of the club c.1940. ... another vintage photo ... and here's another photo from the same viewpoint as in the movie. 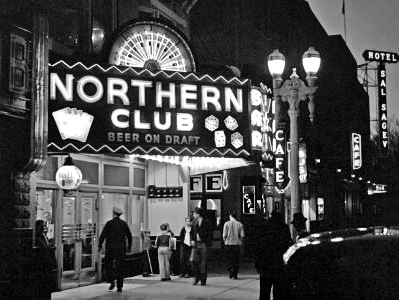 It was taken in 1942, the year the club closed as the Northern. The Las Vegas club and the newly opened Pioneer are further down the block. ... and Now, when the Northern closed, the Turf club took its place. In turn that became the Monte Carlo club then the Coin Castle and in 1999 the LaBayou which is still there under the lofty metal canopy that today covers a four block stretch - the 'Fremont Street Experience' (map). Helen is drawn to a lively craps table and joins in, betting against the shooter, Sam Wild (Lawrence Tierney). An animal attraction is immediately apparent, a fateful meeting destined to doom them both. Up walks a neighbor, Laury Palmer (Isabel Jewell) - she lives next door to Helen's boarding house - with a boyfriend, Danny (Tony Barrett). She confides to Helen that she is also dating Sam but has brought Danny along to needle him and keep him honest. As we shall find out, bad idea.